The West Bathroom a room inside of the Haunted Towers in Luigi's Mansion: Dark Moon. The West Bathroom can only be accessed by taking the north door inside of the West Hall. This room has three sinks and a cabinet on the right side. On the left side, there is a toilet, a sink, a trash can, and a roll of toilet paper. In the middle of the room to the north is a reclining chair that takes Luigi to the Rooftop Pool. 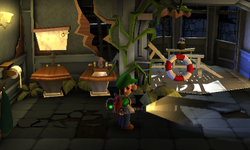 The door to the south takes Luigi back to the West Hall. In Pool Party, Luigi needs to go to the West Bathroom in order to reach the Rooftop Pool. Before Luigi can use the reclining chair to reach the room, he must defeat a Slammer, two Greenies, and a Creeper. In Doggone Key, the Polterpup goes to the West Bathroom and hides inside of the sink. The toilet is missing, but revealing it with the Dark-Light Device and inspecting it causes several coins, bills, and Gold Bars to appear. The chair is up, preventing Luigi from going to the Rooftop Pool. During Hostile Intrusion, the West Bathroom might be one of the rooms infested with ghosts. Starting from Pool Party and most missions after, Luigi can pull the toilet paper roll to reveal an emerald. This page was last edited on March 25, 2019, at 17:56.